Lansing Township is located in the northwest corner of Ingham County, in the south central portion of Michigan's Lower Peninsula. Because of the Township's irregular shape, it has several borders. The western portion of the Township is bordered on the west by Delta Township in Eaton County, on the north by the Grand River and the City of Lansing, on the east by the City of Lansing and on south by the Grand River and the City of Lansing. 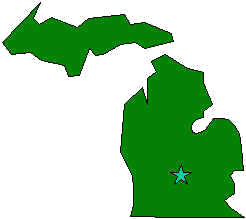 The eastern portion of the Township is bordered on the west by the City of Lansing, on the north by Clinton County, on the east by the City ofLansing and the City of East Lansing, and on the south by the City of Lansing. Population: The Township has a population of 8,919 (1990 Census). Follow these links for:Population Data, Income Data, Summary Housing Data, or Detailed Housing Data.